EVE: Valkyrie has had a storming launch and is set to have an even better summer after news from Fanfest today. 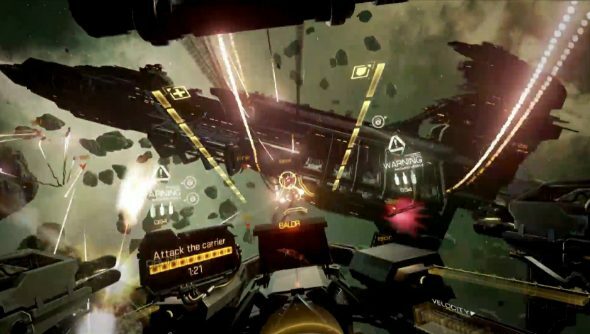 The VR-enabled dogfighting offshoot of the main EVE Online game will be receiving cross-play support between all consumer VR units, including the HTC Vive, Oculus Rift and PlayStation VR. On top of that, a free update is being released introducing a new game mode, Carrier Assault, which sees swarms of fighters attempting to whittle away at the defenses of a massive Carrier vessel. The climax of such a battle is a Star Wars-esque ‘trench run’, as executive producer Owen O’Brien described it on stage, to destroy the core. Cross-play, and the Carrier Assault update, will arrive at an unspecified date in the future, assumedly once all three versions of the game have shipped for their respective headsets.